The recruiting action continued this week as two more prospects committed to Spaz. This isn't surprising. Word is Spaz is focused on filling out the class this summer instead of waiting until Fall. He took a similar approach last year, so that the staff could focus on game prep once the games begin. At this point, I am fine with this strategy as it will either pay off with a better record or provide a new coach a large base to lock in as opposed to finding a bunch of new recruits. The first new commitment came from Ohio Defensive Line prospect Joel Rich. Rich is an under the radar type but impressed at BC's recent camp. He's also friends with Bobby Swiggert, so he's very familiar with life as a student athlete at BC. BC also picked up another player from Eastern Ohio in WR Dan Monteroso. He picked BC over offers from Iowa. Former Heights writer Kevin Armstrong wrote a great article on Tom Coughlin's relationship with Jay McGillis. On the women's basketball scene, Karima Gabriel's long-rumor transfer became official. She played at Depaul last season. Former Harvard forward Andrew Van Nest transferred to BC Friday. A fifth-year senior and Harvard grad, Van Nest is eligible to play next season. The question is how much will he actually play. Van Nest was highly regarded (for a Harvard recruit) out of high school, but saw his freshman season and subsequent career derailed by injury. Because he is only around for one season, this is a low risk flyer for Donahue. If Van Nest stays healthy, he gives us some additional depth on the front line. If not, he doesn't tie up a scholarship beyond 2013. New Jersey guard Kelly Hughes committed to BC. In this article from earlier in the week, Andre Williams explains how the offense less complex this year. It sounds like Martin will be using various formations -- instead of plays -- to keep the other team off balance. This isn't BC specific, but Rivals published an interesting survey of elite recruits. Position coaches are far more important to the process than most realize. It also was refreshing to see so many recruits say academics were important. Of course they rarely follow through with that come signing day. Since everyone has Spaz on the Hotseat List, now is as good a time as any to look at future BC head coaching candidates. Unlike our past profile series, the timing and style on these posts will be a little different. Instead of being weeks or days away from a potential change, we have the benefit of a whole season to evaluate these guys. Some stocks will rise, while others will fall and it will make our usual scoreboard watching that much more interesting. The second part of the series will look at current head coaches who don't have the resumes to take the job now, but could get consideration if they win this fall. The added twist is that all the guys have some tie to BC or Gene. Our past three head coaches had zero head coaching experience prior to taking the BC job, so prior head coaching experience is not a prerequisite. But I do think it will help any potential transition to BC. In fact if we hire a guy who lost at a previous school until this year, we receive the benefit of his head coaching learning curve without all the loses. This name should be familiar to most since Clawson was a surprise candidate during the 2007 search. At the time he was a rising star in DIAA and had worked with Gene back in the Villanova days. BC fans were surprisingly receptive to his candidacy then. The years since have been a rollercoaster for Clawson. He left Richmond to take over play calling at Tennessee. Richmond won a National Championship and Clawson became a scapegoat for all that went wrong in the final Fulmer days. He landed the Bowling Green job, had a great first year, terrible second and losing third. Even if Clawson has a strong year in 2012, I don't think he'll be a hot name nationwide. The stink from Tennessee is still too strong. But I do think Gene would revisit the potential fit. One thing we've learned in this process is that personal relationships with Gene carry a lot of weight (if Gene is still calling the shots). What to watch for in 2012: Clawson needs to win. Not blow the doors off, MAC Champion type winning, but prove that he can turn a FBS program around. If he goes 8-5 or 7-6, he might be a tolerable replacement for Spaz. If he does really well, that makes it even better. Bowling Green is expected to improve this year, so that will give his candidacy some momentum. If Gene is not involved in the hiring process, Clawson's going to need 10 or 11 wins to even get on BC's radar. Despite his losing record Macintrye enters 2012 as a "hot" name. He was a well respected assistant and impressed people with how competitive the Spartans were last season. If he has a winning third season, multiple programs will be interested. As far as being a fit at BC, Mac's got ties to the ACC, coached in the northeast at Temple, coached at schools with tough admissions departments, and worked for Parcells. He'd be pretty ideal except for one looming issue -- his ties to Gene. Macintyre's first offensive coordinator at San Jose State was John Defilippo. If Macintryre interviews there will be the perception that he's another Gene puppet. That might not be fair to Mac, John D or Gene, but that is the reality. What to watch for in 2012: Winning primarily but also how their offense changes now that John D has returned to the NFL. The young Defilippo actually has a pretty good reputation in coaching circles. If his last name was Smith, BC fans wouldn't care one bit about Macintrye's former OC. But I do think the offense will play a part in his BC candidacy. If they explode will it impact how Gene views Mac? Will it mean that Mac knows how to build a staff and find good replacements? Will it mean that he can bring his new OC with him to the Heights? I actually like the idea of Macinyre right now, but he does need to win this year. Another familiar name to BC fans. Not only did he interview in 2009, but he was on TOB's first BC staff. The long time assistant finally got a shot at a Head job when he took over Miami of Ohio last season. The Redhawks finished a disappointing 4-8, but they are expected to rebound this year. Treadwell was never the most exciting guy in the room, but he has a solid reputation and could probably have a TOB like career if BC hired him and gave him time to build a program. What to watch for in 2012: Can Treadwell win enough to leave after just two years? Miami is his alma mater, so walking away won't be easy. If they win seven or eight games and he bails, that will be a burnt bridge and follow him on the recruiting trail. It they win the MAC, he can claim "I've won a championship and now I am ready to move on." Miami is known as the "Cradle of Coaches", but you still have to leave in the right way. Swepson is a long-time BC assistant who followed TOB to NC State. Last year he became a head coach for the first time at FCS school Elon. Swepson also has the added benefit of being a BC grad and former player. What to watch for in 2012: Winning big. Real big. That is the only way a Swepson candidacy becomes tolerable. Let's face it, no other BCS program in the country would even consider Swepson after just two years at Elon. The only reason we might is because he's one of us. Swepson's first year was okay (5-7) but he needs to get to 10 wins for this hire not to leave people feeling empty. If he is hired after a seven win season, then you know that our coaching search was a disaster. Phil Steele made his name by publishing the most thorough, analytical and detailed college preview annually. He boasts that he's right when everyone else is wrong. In his latest edition, one of the teams Phil thinks will surprise is BC. Phil's not behind BC for just some random reasons. He's always put an emphasis on returning starters and BC's rates high in that department. Steele also likes that BC faces most of its toughest opponents at home. BC's close losses from last season are also factored in (Steele think luck tends to revert to a mean -- so BC will do better in close games this year). Steele also predicts improvement from Rettig (due to Martin and maturity) and thinks our offensive line will be better than it has been in years. Although he touts BC as a +3.5 on his new Stock Market metric, Steele's not predicting greatness for our Eagles. The magazine has us 4th in the division and playing Army in the Military Bowl. Still, that is relatively high praise when most magazines expect us to have another losing season. I understand where Steele is coming from. All his factors give me some optimism. We should be better on offense. The defense does have some good returning talent. I like Doug Martin and what he represents. Yet I don't think it is that simple. Steele believes that some of the bad losses will even out this year. I'm not there ready to take that leap. Many of the reasons we've been in so many close games under Spaz is because he manages the games that way. He doesn't put teams away and doesn't go for broke when we trail. Is that suddenly going to change this year? I want BC to win. I want to make a bowl game. I may not care for Spaz, but I love BC and watching winning football is fun. I hope Steele is right, but I still think this year will be as frustrating as last year. Playoffs are real! What does it mean for BC? The college presidents finally approved a four-team football playoff. It has been a long time coming and some details are still to be determined, but this will change the college postseason for the better. I also think that this system benefits a school like BC. First the good news. 1. We don't have to be perfect. Under the old system BC needed to go undefeated and hope that only one other BCS team also went undefeated. The polling system always favored the traditional powers. There will still be plenty of bias in the selection committee, but supposedly there will be a formula that incorporates win-loss, strength of schedule, and conference championships. In this world a 11-2 ACC Champion BC team might earn a playoff spot. This also means that any great BC team (13-0, 12-1) will surely be in. 2. We still have a seat at the table. The ACC has been damaged in this process. It's the Big Four and us. That will hurt in recruiting and in rankings. But at least we are still at the big table. The ACC will have its turn on the selection committee and we can still pitch access to the playoffs to recruits and fans. 3. An expanded playoff is coming. Everyone is quick to point out that the Presidents don't want playoff creep and that it will be a four-team format for 12 years. I think it will stay at four teams for five years at the most. There will be too much public pressure to expand and too much money to ignore. An eight-team playoff is even better for BC financially and access wise. 4. The ACC will be rewarded for playing nine conference games. Strength of schedule is a factor in the selection. With the ACC playing nine games, we will get a SOS benefit that other conferences don't when they play patsies. This also might have BC rethink its annual FCS game. 1. The ACC is still poachable. Florida State or Clemson might have an easier path to the playoff from the ACC, but there is no built in advantage like there might have been under a strict conference champion provision. As long as other conferences offer more money, schools might leave. 2. There will be a human element to the selection committee. There will be bias and subjectivity. BC will always face an uphill battle against the power brokers. I know that we will be the "5th" team at least once in my lifetime. 3. The bowl system lives on (sort of). The old boys running the playoff protected their cronies at the bowls. They're less important and will face new financial pressure, but the bowls still live on. And their distaste for BC and our travel reputation will not go away. So this means that is will always be playoff or bust for BC. BC Basketball Video Coordinator Dan McDermott tweeted the latest image of the new Alumni Stadium Wall. 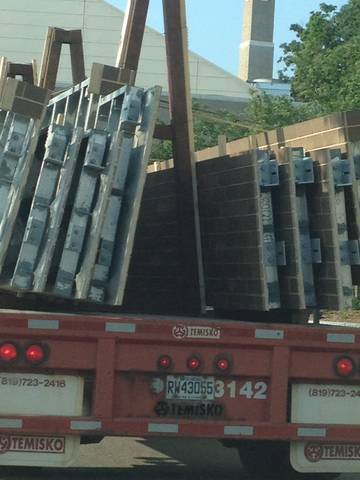 When we first saw the brick slabs on the back of the truck, I complained about the drab color scheme. Now that some slabs are partially installed, I think the brick color works well. It blends in seamlessly with the interior of the Stadium. Maroon or red might have clashed. I know many are indifferent towards the renovations, but I think watching the progress over the summer is cool. If you get a chance to take a picture, be sure to forward it along or share via a social network. HD held a Q&A with Chris Pantale. What I found refreshing was Chris's candor. He spoke of the difficulty learning new offenses, his desire to step up and the attrition of his old teammates. The class you came in with, why did it get so small? CP: Part of it was the coaching changes. Some guys came in with bad attitudes I guess, thought they should’ve been playing right away. Some of the guys I came in with had a bigger ego and when they didn’t play right away hung their heads a little bit and started to slack off in school. They brought it upon themselves. It wasn’t what BC did to them. It was their own fault for most guys, but some guys left for what they felt was better options. You can’t blame them if they didn’t feel like they didn’t belong there. The character of Jags's mega-class has been questioned for years. I am surprised that a current player finally spoke out about it. Ohio running back LeShun Daniels committed to BC. He's a good and much needed addition to this class after the decommitment of Virginia running back Josh Tapscott. Daniels' offer list is thin but I like what he showed on this tape. BC High's Jack McDonald committed to UVA. Trey Kilgore verballed to Michigan State. The first series of names are guys BC should call regardless of what happens in 2012. This is the A List. They are all high-profile and could probably wait on bigger or better job. But there is a chance that this season could make BC seem that much more appealing in December. If you were to make a list of all the attributes you would want in a BC coach, Mullen has them. Major college head coaching experience, innovative offense, fiery personality, local ties, experience working at a school that takes academics seriously, aggressive recruiter, youth and a winning record are all there on paper. The challenge with approaching Mullen is that he doesn't need BC right now. He's got an SEC job. He's getting paid well (more than BC pays Spaz) and he can probably wait on a bigger better job than BC or Mississippi State. What to watch in 2012: Potential losing. Mullen's name has floated for enough jobs in the past few years that you know he or his agent has a wandering eye. He knows that Mississippi State is not a destination job. No one wants to battle LSU, Alabama and Auburn just to win the division. If the Bulldogs stumble a bit this year -- say 5-7 -- Mullen is not going to be a hot name for the big jobs. However, we would still be interested. BC could offer him a few years security, a chance to rebuild again and do it without having to buy off the next Cam Newton. Mullen's mentor Urban Meyer has shown that he likes the climb to greatness better than trying to maintain it. Maybe Mullen is of the same mold. And maybe BC will offer that chance at the right time. It's a long, long shot, but BC has to make that call. Calhoun shares many of the same qualities we would desire in Mullen, only with a slightly longer track record and with the added benefit of NFL experience. The big difference from Mullen -- who is from New Hampshire -- is that Calhoun has no local ties. Plus he's coaching at his Alma Mater! If this guy is going to leave his school, why would it be for the BC job? It's a long shot that he would end up at BC, but there are some things in our favor. Calhoun wanted the job when Jags got it and BC never even called him. He wants a shot at a big conference job, but without putting up with the nonsense that might go into most BCS programs. He's worked at Wake Forest, so he knows it can be done in the ACC and done the right way. What to watch in 2012: What other schools have interest. Calhoun's enough of a name that he should appear on most teams' short lists. Oregon State will come calling. I could see Cal being interested too. BC's hope would be catching him at the right time with the right pitch. Another season above .500 isn't going to make him unattainable to BC, but it will make him seem like a solid hire to all the programs that have money and openings. Right now he's probably the most popular name among the speculators. Even if you ignore the lack of head coaching experience, his minimal time in college, or the questions surrounding how much of his success is tied to Payton and Brees, if BC were to land a young, Super Bowl winning offensive coordinator -- who happens to be a BC grad -- as our next coach, most parties would find the result more than satisfactory. When it appeared that Carmichael would serve as the Saints Interim Head Coach, I thought that the new position would prevent him from being a BC candidate in 2012. Like all things with the Saints and the NFL, the situation remains complicated, but I don't think we can rule out a return to the Heights. What to watch in 2012: How Carmichael handles himself calling the plays. There is enormous pressure on him this year. If the Saints don't miss a beat, everyone in football will want him. If they struggle, he might be one of the scapegoats. For him to end up at BC and not being damaged goods, I think we have to hope for the Saints to miss the playoffs but not due to the offense. Things are enough of a circus that they could easily go 7-9 while still being one of the top 10 offenses in football. And if that happens, maybe the idea of being a head coach for the first time at a place he knows will be an appealing escape from New Orleans. Roman was already being talked about as a good fit even before Bruce Feldman dropped his name as a potential Spaz replacement. Gossip says that he wants to return to college, return to the northeast and coach at a program "where things are done the right way." How much of that is true is anyone's guess, but his mix of recent college success and NFL credibility are very appealing. If he wants to be a college coach, he will get a shot soon. What to watch in 2012: How his profile rises among NFL teams. The 49ers surprised everybody last year. The defense carried the team, but Roman's rehab project on Alex Smith was equally impressive. If Smith improves this year, Roman will be a very popular name on NFL short lists. Timing will be a factor again. If BC makes a move, we will still be hiring before most NFL teams. We will have a chance to talk to Roman before he even knows his NFL options. If he really wants a college job, BC should make the call. As Justin Rowland wrote, this is a big week for BC recruiting. Two priority prospects are expected to make their decisions. The first is Cinci WR Trey Kilgore. Most are calling him a Michigan State lean. The other key player is BC High OLineman Jack McDonald. He's got offers from half the ACC. In normal years, I would say he is a BC lock. Now I think we need to work overtime to get him to stay home. Another Ohio prospect Moeller TE Evan Jansen plans to visit BC. He doesn't have elite offers, but we've done well with players like him from the Cincinnati area. The Chicago Blackhawks drafted future future Eagle Chris Calnan. Soaring to Glory previewed Spenser Rositano. They also looked at Andre Williams. Incoming baseball player Chris Shaw started his summer league strong. The busy recruiting week continued as word leaked that kicker Michael Geiger committed to BC. Private kicking coach Chris Sailer made the announcement via Twitter. Geiger is from Toledo and considered one of the better kicking prospects in the nation. Below are some of Geiger's highlights. Welcome to BC and congrats to Spaz for keeping up the momentum. BC announced the newest members of its Hall of Fame. Inductees include Mike Mamula, Marty McInnis, Amy LaCombe, Maria Cicero, Antonio Granger, Casey Schmidt and Lou Tessier. The one bit of controversy was the announcement that Mark Chmura was also included. Some people feel that Chmura's 2000 incident with his babysitter should exclude him from such an honor. At this point I am fine with him being included. He was found not guilty and I think this is more about honoring his achievements while at BC. Chmura's put the incident behind him, so shouldn't most BC fans? ESPNBoston posted great feature on former captain and current Director of Ops Peter Frates. As most know, Frates is battling ALS. It is nice to see his story reach a wider audience via ESPN. This compares the APR trends of all the ACC football and basketball programs. Football improved slightly while basketball fell. Hockey East invited UConn to join the conference. I find it interesting that we allowed this entry but have opposed UConn as an ACC school. I guess most of the bad blood between the schools was really related to football and basketball. Al Washington's Facebook page is the source of news again, as he states that BC has another commitment. Because of reporting rules, Coach Wash doesn't name the player, but it is generally assumed to be Defensive End Kevin Kavelec out of Cleveland St. Ignatius. While not highly rated Kavelec fills a major need and comes from a traditionally strong program with BC ties. I like the addition. We will see when official word comes from the Recruiting sites. In addition to his work on the BC beat, Eric Hoffses also covers college basketball recruiting in New England for Rivals.com. With Donahue and his staff in the middle of the important and competitive summer recruiting circuit, I thought I would check in with Eric and get a feel for BC's recruiting plans. Q: The summer recruiting season is in full swing. Who are the most realistic names on Steve Donahue's short list? Eric Hoffses: Samuel Dingba from the Salisbury School is a guy I could see being a fit in the class 2013. He’s a 6’6” power forward that’s a good defender and rebounder and plays bigger than his size. BC offered him in May. There is a real need for a power forward and he seems like the most likely guy to fill the void. If you are a believer that the current core of freshmen are the real deal then you will think Dingba is a great fit. He would fill a void that is missing on the current roster. Q: Who is the biggest reach/elite recruit that you could see BC landing? Eric Hoffses: Noah Vonleh is tops on the list, and I’ll talk about him more in a bit. If you are looking for a player that’s going to be a top 100 guy and has a good chance to come to BC I’d pay attention to 2014 player Kaleb Joseph. He is a PG from Nashua, NH that plays for Cushing Academy. He can do it all from scoring, to passing, to being a leader. Joseph is a real good kid too and it’s not lost on him that BC was the first big name school to offer him. This is a big weekend coming up for BC. A lot of the top New England prospects in the class of 2014-2015 are coming in for their Elite Camp. It gives the staff a good opportunity to evaluate players in their offense, and it gets big name players on campus. Q: Do you expect anyone to commit over the summer? Eric Hoffses: Probably not unless it’s a fringe/under the radar prospect and I don’t think the staff is going to push for any of those right now. With a low amount of available scholorships the staff has to be selective. There isn’t a need to panic yet with so much time left. The players can’t sign until November in the early signing period, so they probably won't start committing until late August/September. Q: Do you think Donahue will over recruit given the number of scholarships available? Can he risk it on the chance that a current player will leave? Eric Hoffses: No I don’t. It’s believed that they have 3 scholoroships to give out between the 2013 and 2014 classes right now. They are going to keep at least one open for superstar Noah Vonleh. For those who haven’t heard of Vonleh, he’s one of the highest ranked players in the class of 2014 and he’s from Haverhill, MA. He plays at New Hampton prep, one of the local prep schools that BC has had a very good relationship with (2012 recruit Olivier Hanlan played there). Unlike some other superstars who have came through New England, there’s at least a small chance BC could land him. He still mentions BC in interviews alongside the likes of North Carolina, Syracuse, ect. I think the staff sees a real chance at landing some huge names in the 2014 class. This is the class that people who follow hoops closely in this area have been talking about for years. I’m talking about the type of guys that can come in and average double digits as a freshman. With that being the case they aren’t going to leave themselves shorthanded. It’s going to have to be considered a huge disappointment if BC doesn’t land any of the big names in this class. The Globe published an interesting article on future hockey player Chris Calnan. The Nobles product is torn between three paths for a young hockey player. He wants to stay at Nobles but also wants to prepare for the next level prior to his time at BC. BC target Jacquille-Veii scheduled a visit to campus. The Maryland athlete is one of many BC prospects in the DC-area. HD ranked our schedule as the 10th toughest among the ACC schools. Army and Maine give the appearance of easy scheduling but I think Notre Dame and Northwestern will be tough games. This picture comes courtesy of regular reader Ryan. It shows the slabs of prefab brick wall being delivered to Alumni. A few interesting developments can be inferred. First the color of the bricks matches the same color schemes in and around Alumni and Conte. Since the old padding was maroon, I wondered if the bricks in the wall would be maroon or a shade of red. I think a red wall against the green turf looks better on TV. I fear this might look a little dull. But I'll hold out hope until the project is done. The second development is that it appears this wall is not real brick and will be significantly (if not all) prefabricated. I know next to nothing about construction, so this might be the most current method for building a brick wall. I just assumed they would be laying each individual brick. If it is all prefab, I don't know why the project will take so long. I also don't know how the wall slabs work from an economic standpoint nor a repair standpoint. If anyone is familiar with this, please comment or email me. I also wonder and hope that the faux wall will be easier on the players. I can't recall a player running into the old pads, but it was a nice safety precaution. Our walls are close enough to the field that a crash could happen. I also would love to know about the acoustics of a less dense wall. Will is muffle or amplify noise? So many questions. Who knew a little wall would be so interesting. The day after his glowing feature in Eagle Action, Connecticut LB Cory Jasudowich committed to BC. According the Recruiting services BC now has six commits, yet Al Washington has a different tally on his Facebook page. Look for the new name to pop up in the next few days. New Jersey athlete still thinks BC will offer him a scholarship. Soaring to Glory takes a look at Jake Sinkovec's position change. At this point I think players like Sinkovec just want to contribute. If we are stacked at LB, why not try him on offense? Michigan State offered BC target and St X Wide Reciever Trey Kilgore. In most years opinions on BC vary. While we were predictably above average for ten years, there were always a few experts who went out on a limb to predict a great or terrible year from BC. This year, there is a consensus -- most think BC will be near the bottom of our division. Connecticut LB Cory Jasudowich says that BC is his favorite. He still plans on visiting other schools. HD ranked the best QBs in the ACC. Rettig comes in at 11 which I think is a bit misleading. His stats haven't been great but has shown more upside than some of the guys ranked ahead of him. Let's see how Rettig does once he's actually allowed to air it out. Did BC make money switching conferences? We will never know officially since BC doesn't have to disclose its numbers like a public university. But you would have to imagine our costs and new revenues would follow a similar track to the other schools. Based on Virginia Tech's growth, BC probably had a small but positive gain. Herzy is fighting for a starting position with the Giants this year. Illinois WR Matt Harris is a bit small, but has plenty of speed. BC and Northwestern are both interested. There is a lot to be proud of with the BC hockey team, but I think their continued reach into the community puts the championships in perspective. It shows that our best team can also take time to be part of the community. We're fortunate that so many BC athletes make a point to represent us beyond the playing field. Here is a story on incoming basketball walk-on Mike Mendes. Wake Forest picked up a recruit from Massachusetts. It's one of the rare cases when BC didn't even have interest in a local talent. Pennsylvania athlete Quinn Thompson just visited BC and hopes to make his final decision in the next month. Even non-BC bloggers think this is Spaz's last season. 2014 super recruit Da'Shawn Hand has offers from everyone. Yet BC was there first. 2013 basketball recruit Solomon Mangham recently visited BC in an unofficial capacity. ESPN recently announced they will shutter their High School Sport coverage. This doesn't really impact BC, since very little of ESPN's high school stuff focused on New England nor incoming BC students. But it did get me thinking about the local coverage of high school and college sports in the Globe and the Herald. What's unexpected and frustrating is how good the high school sports coverage is compared to the college sports. For two struggling papers in a struggling industry, the Globe and Herald generate a ton of varied and in-depth high school coverage. And its not just football and basketball. The locals get plenty on women's sports, lacrosse and baseball. I would like to think this is a measured business decision on the parts of the paper. I am sure they rationalize the allocation of resources by saying they sell more locally because of high school sports or that it is cheaper to cover. But even though much of the Herald's coverage is rolled up by its local town papers, this still cannot make sense. Based on the Globe's own displays of popular articles, high school sports barely registers. Declining subscriptions of all papers surely aren't impacted by high school sports or else you would see even more coverage around the nation. People like seeing their friends and family in the paper, but how many people does one softball pitcher from Quincy know? It just can't be moving the needle. If ESPN cannot make money on it, I doubt the locals are. What I think happens with high school coverage is that people at the papers care more. The young writers assigned to the beat are aggressive and looking to hone their skills and get noticed. The editors who assign the stories are probably a little older and members of these communities. They perceive more value to that coverage because it is hyper-local and personal. It is not speculative piece on the BCS or which school is moving to what conference. I also blame the more experienced writers on the college beat. I know in the past summer was always a time for them to take off or relax a bit. But those days are gone for most college writers. It is now year round beat. There is plenty of news and features that can be run. If bceagles.com and the online sites can create content year round, why can't the Globe or Herald? I know we care more, but we are also generating page views. Those are lost opportunities for the papers. And with the viral nature of sports, a good BC or college article can bring in 100 times more traffic than a high school story. Think of how many tweets or links you've read in the past two months from Florida papers regarding FSU or premier college writers from newspapers getting linked nationally. That's not happening in Boston. It is a shame too as I think local college coverage will continue to die. I just wish some of those promising local high school writers were given the same encouragement and support to cover the local college landscape. The old guard is failing us and its employers. A day after we put a pic up, BC released their own shot of the new field. Hopefully they keep documenting and sharing the progress via social media. Heights and Lows has the first look at the new SuperFan shirt and an all important ranking of the slogans. Some of us are old enough to remember when the shirt had nothing on the back. BC offered Ohio TE Kevin Kavalec. He currently has offers from MAC schools, but I don't mind us reaching a bit on a kid from St. Ignatius. At one time it was a mini-pipeline for us. Getting our foot back in the door there may pay off down the road. Virginia prospect Brandon Ravenel had good things to say about BC. The field of our early Novermber Tournament in Charleston is set. BC won't be favored but that is a winnable tournament. Baylor and St. John's have the most returning talent, but all of those teams will be replacing key contributors. BC -- of course -- will have 90% of the team back. Here are the bios of Mike Gambino's latest recruiting class. The Globe published a great feature on Anthony Melchionda. With most of the media and fans predicting a long season that ends in Spaz's firing, ESPN's ACC blogger Heather Dinich took a different stance today. 2. Boston College: The Eagles could be one of the surprise teams in the ACC in 2012. Last year's roster was filled with underclassmen, including quarterback Chase Rettig. The running back position has enough depth even without Montel Harris, and first-year coordinator Doug Martin said the offensive line should be one of the team's most improved groups. The receivers remain a question. The defense -- and entire team -- will miss linebacker Luke Kuechly, but with 16 starters back, including seven on defense, the Eagles should be able to still show improvement. I don't share her optimism, but I do see her point. But I think the optimists are overlooking some key aspects of last season's record. We didn't just lose because of injuries, talent and experience. We lost games because some of them were grossly mismanaged. That's not going to change this year. Spaz is still in charge of the clock and timeouts and our overall game plan. Northwestern and Duke games swung due to some head scratching decisions. We gave up way too early against Clemson and had numerous other issues in different games. As long as Spaz is in charge, we will continue to play close games. That's the nature of his game management. And if you play enough close games some of them are going to break the wrong way. Faithful reader Pete provided this peek into Alumni's renovations. As you can see, the old turf is completely removed. The base wall and padding are also gone. Will BC be one of the more desirable open jobs this season? While finding the right coach is never easy, timing may help if BC makes a change this offseason. Due to recent coaching changes at other schools, very few elite jobs will be open this fall. For the first time in a long time, BC may be able to bring in an established name. The supply and demand dynamic of college coaching is fairly unique. If you consider college and NFL assistants, there are literally more than 1,000 qualified coaches for 120 positions. And if you narrow the scope even further, there are only 60 jobs among the five power conferences. The industry is full of hyper-competitive guys looking to get their shot. That is why you still see people risk taking career killing jobs (like Al Golden going to Temple). Everybody wants a chance to be in charge. But if a school like BC doesn't want to take a flyer on an unproven or lessor known assistant, they usually have to wait in line. Because once a good coach gets a good job, he's not going to move unless the next job is clearly better. That pecking order comes into play when BC is looking for a coach at the same time as a power program. Look at last season as an example. Both Ohio State and Penn State filled openings. Pretty good Pac 12 jobs at UCLA, Arizona and Arizona State all made new hires. UNC -- despite unresolved NCAA issues -- snagged an experienced coach. Plus there were a half a dozen other BCS conference openings filled this past offseason. If BC had made a change then, we probably would have competed for many of those same candidates and lost out. But the mass changes the past two college football offseasons has created a new hiring cycle. Fewer elite football schools will be making a change this year. Look at the Hot Seat Ranking. What potentially open job is that much better than BC? Tennessee for certain. Maybe Cal. Texas Tech, Oregon State and Indiana may offer more money, but I think we offer a better "fit" for some coaches. We feel the need to apologize for what BC is as a football school, but a shrewd coach will know what it can be. They see that TOB and Jags won at BC and know that it doesn't take a rocket scientist to win here. Heck, even Spaz has two winning seasons and is over .500 for his career. BC offers low expectations in a low pressure media environment. While not sitting in Florida or Texas, BC has access to decent recruiting territories. You can get enough talent to compete in the ACC. Recruiting is more restrictive than it might be at most BCS schools, but there is a flipside benefit to that. BC kids in general are coachable and hard working. Stanford and Baylor are the most recent examples that with the right guy leading the charge, you can sell academics and recruiting successfully. The drawbacks to BC...we know them already: facilities, potentially meddlesome AD, smaller fanbase, obstacles to elite recruits, and money. Even though I think BC would pay more for an established name, we are never going to have the highest paid coach in the ACC. Rarely will our coach be in the top half of ACC salaries. But none of those issues are insurmountable. If a coach wins, better facilities and money will come (see Coughlin, see TOB). Gene's reputation is for being Coach Flip, but I think a rough season from Spaz will neuter some of his power related to football. An established coach will demand more freedom. Then there is the stepping stone issue. Once a guy wins at BC either other people come calling or the place starts to feel small. That's not going to change. What I hope does change is BC's approach. Let a new guy come in and win. We don't need a lifer or the next TOB. Just leave BC in a better place, give us some exciting football and keep close ties after you're gone. Call it the Tom Coughlin model. According to Eagle Action reporter Eric Hoffses, Montel Harris is transferring to Temple. Despite some speculation, Harris did graduate from BC (enabling the transfer). The move reunites Harris with his former Offensive Coordinator Kevin Rogers and former BC assistant coach Ryan Day. I don't know how healthy Montel's knee is but I hope he has a strong season. He deserves it. Boston College used two quarterbacks last year -- starter Chase Rettig and backup Josh Bordner – but first-year offensive coordinator Doug Martin said that won’t be the case this season, at least not intentionally. “I don’t see us doing that,” he said. Rettig finished the spring as the Eagles’ top quarterback, followed by Bordner, but Martin said he is comfortable with both of them. The Mets drafted incoming Baseball Freshman Chris Shaw. Shaw says he's still coming to BC. New York has until July 15 to sign him. Recent BC baseball grads Matt Brazis and Anthony Melchionda were both taken in last week's MLB Draft. Basketball Prospectus liked Ryan Anderson's freshman year statistically. John Muse signed with the Carolina Hurricanes. The Big Ten Network will carry the BC-Northwestern game. It will be a 3:30 pm start. This is a really good article that explains the ACC-Raycom relationship. It also dismisses all the conspiracy theories regarding John Swofford -- including that BC got into the ACC because his son worked at BC during expansion. The co-ed sailing team was unable to follow up the women's title. They finished seventh overall. This is from earlier in the week, but ESPN thinks BC is the least desirable basketball job in the ACC. I think this drastically overlooks our history and BC's advantages. I would argue that BC is a better job than Miami, Virginia Tech, and Clemson. In his latest mailbag, Bruce Feldman became the first national media member to address the Kevin Rogers issue truthfully. As most BC fans have known from the start, his departure had nothing to do with health issues. Sources close to the BC program told me Spaziani has had all sorts of trouble with staff chemistry issues. Key assistants Ryan Day and Kevin Rogers bailed to Temple. Spaziani had crossed a personal line with Rogers early last season and the spin that came out of that couldn't solve a fractured staff. Spaziani was a good defensive coach, but hasn't shown he can manage a staff and run a program. It's been rumored to be a fist fight. A verbal fight. Insubordination. Regardless, it wasn't health and is one of the reasons the season fell apart. Maybe if Spaz had been allowed to hire Brock in the first place, it wouldn't have played out like it did. Former BC Eagle Jo-Lonn Dunbar is the latest player to get caught up in the Saints Bounty story. The good news -- according to Michael Silver -- is that he is unlikely to face league punishment. The alleged $200 cash payment came after the Saints playoff win over the Lions. The play in question also did not injure the opposing player. Gregg Williams clearly liked Dunbar as he encouraged the Rams to sign him as a free agent. I also don't fault Jo-Lonn and never found him to be a dirty player at BC. Let's hope Silver is right and he does escape punishment. I don't own this...but don't think I haven't thought about buying it. Mgoblog recently published a post on embarrassing Michigan licensed items. I loved the idea and thought that I should do the same for BC stuff. There was one problem. As I searched for weird and offbeat BC things, I just kept coming across items that I might actually buy. There was nothing too kitschy. Nothing offensively ugly (to me). I rationalized every potential purchase. Fortunately I held strong and didn't buy. The following are some of the more tempting items. I don't wear hockey jerseys, but I loved this custom BC hockey sweater that merged the BC logo with a Pittsburgh Penguins style look. I'm not big on cheese plates but this is something I might break out. Look at the subtle BC logo on the wood top. That's not corny. That's classy. Under normal circumstances I wouldn't buy a Tiffany Lamp. I also dislike our current logo. But put the two together and it sort of works. Maybe I should forward this to my wife to inspire some Father's Day ideas. If a Harvard guy wore Harvard cufflinks, he'd be pretentious. If an Alabama fan wore 'Bama cufflinks, he's a rube. But a BC guy could pull it off. I don't own a dog nor do I plan on getting one soon. But you can bet that if I do get a dog, the poor thing will certainly have to wear one of these. BC Boat Fender? Sure. Why not? They say the two best days of being a boat owner are the day you buy your boat and the day you sell your boat. I've never owned a boat, but I don't see it that way. In my mind the best day of being a boat owner would be the day you bought your BC Boat Fender. My kids three kids are too old for this now, but I am suddenly feeling the urge to have a fourth. Let me know if there are any other BC licensed items that I should consider. Also let me know anything not so embarrassing that you might own. Will Reggie Jackson see any playing time during the NBA Finals? Reggie is close to the Championship, yet so far. Reggie Jackson is four wins away from becoming an NBA Champion. Oklahoma City will be heavy favorites against whichever team wins the East and they will also have home-court advantage. The former BC star will have a front-row seat for most of the action. His problem? He's not likely to get on the court. Jackson had a decent start to his first professional season. A short stint in the DLeague did not hurt his confidence or the Thunder's faith in him. They recalled him, played him again and kept him on the active playoff roster. Once the postseason started though, Reggie has not come off the bench. That's only natural as the games are tighter and the rotations get shortened. But still...of the 15 players on the Thunder roster, only two -- including Reggie -- have not logged a single minute of playing time in the postseason. Obviously Reggie has value to the team and his teammates. He's part of the preparation and his contributions helped OKC get to where they are. With the games now at their highest importance, I don't expect Reggie to come off the bench and catch the world by storm like a Jeremy Lin. I do hope that one or two of the Finals games are blowouts and Reggie can get some official minutes. It must be frustrating for someone like him. He knows he can play. He just can't get minutes on the NBA's best, young team. I think he'll persevere. Either another team will come sniffing or OKC will allow him to grow. Whatever his future, I hope he dose appreciate where he is. There are hundreds of BC basketball alumni who would kill to be part of an NBA Champion...even if they didn't play. Connecticut Quarterback Tim Boyle committed to BC and Spaz Wednesday. There is a lot to like about Boyle (see below), but what I am most excited about is that he is our second QB in this class. In a way I want Spaz to recruit like Noah trying to fill the Ark. We need two of everything! I think depth at key positions in this class is critical, because I anticipate this will be a transition class. If we do make a coaching change, many of our current commits will go elsewhere. By having two QBs in the fold BC hedges on one of them ditching BC if we make a coaching change. Even if BC doesn't make a change, taking two QBs fits with the Steve Logan/Doug Martin strategy of recruiting two guys. The benefit of taking two a year means that over the course of five recruiting classes, you will have 10 potential QBs. It is a lot easier to find one really good QB and two decent ones when you bring in 10 as opposed to five or six. It is sort of a throw enough stuff against the wall and see what sticks. The guys that don't work out will leave or learn a new position. BC's move to the ACC still generates criticism. Some old school fans miss Big East Basketball and the media still harps on BC's fit with a "southern" conference. But most reasonable sports measures would deem the move a success. With another potential shuffle on the horizon, some fans are questioning if BC needs to be in a major conference. The financial commitment and the compromises on the academic side have people wondering what the net benefit is to the University. A new study shows that conference moves and big time sports do benefit the school as a whole. Schools like BC see admissions become more competitive and see a higher percentage of admitted applicants matriculate to the school. I worry about what the college landscape will look like in 10 years and where BC will fit, but I think studies like these show that BC needs to be aggressive in our positioning. That mindset has helped make BC the school it is today. One year after their sudden departure from BC, Dominick LeGrande and Okechukwu Okoroha emerged as transfers to Marshall. Both are immediately eligible and both have their degrees from BC. The tone of this article on Florida DE Brad Smith makes him seem lukewarm on BC. BC target and Missouri DE Donnie White Jr. is using his uniform to help gain attention. Virginia athlete Josh Tapscott committed to Spaz earlier this week. He's not highly rated, but I like his upside and picking up a kid in Virginia. BC also offered 2014 QB prospect Trace McSorley. The Basketball team released their final roster. It includes Dragicevich and updates Kilcullen's for transfer. One of the stats I do like is returning starters. If there is a real causation, we'll surprise people this year. BC offered Cincinnati area OL prospect Dylan Wiesman. Regardless of the stars, I think BC needs to keep up a Cincinnati connection in this class. Ron Brace's was honored by his high school. Steve Flynn is excited about his walk-on opportunity at BC. Heights and Lows embraced the idea of football returning to Fenway. 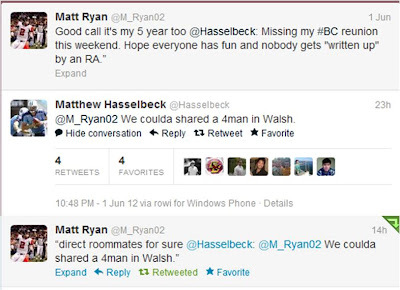 The above is a twitter exchange between Matt Hassellbeck and Matt Ryan. It's a harmless series of tweets but it got me thinking about what if the Matts had been on campus at the same time. Outside of their NFL pedigrees, the Matts had a lot in common. Both were tall, well-rounded recruits from Northeast private schools. Both had decent offers aside from BC, but neither were considered top recruits. But where I think their BC careers become very similar is their ability to shine through QB controversies. Hasselbeck earned starts as a redshirt sophomore. Only the following season saw him lose his spot in the preseason to Scott Mutryn. Hasselbeck persevered, pulled out a game in Hawaii and never looked back. Ryan also endured a frustrating QB controversy. He won games as a back up, lost his job when Quinton Porter came back and then earned the job back. As we know, once Ryan earned the job, it was his for the next two and a half years. 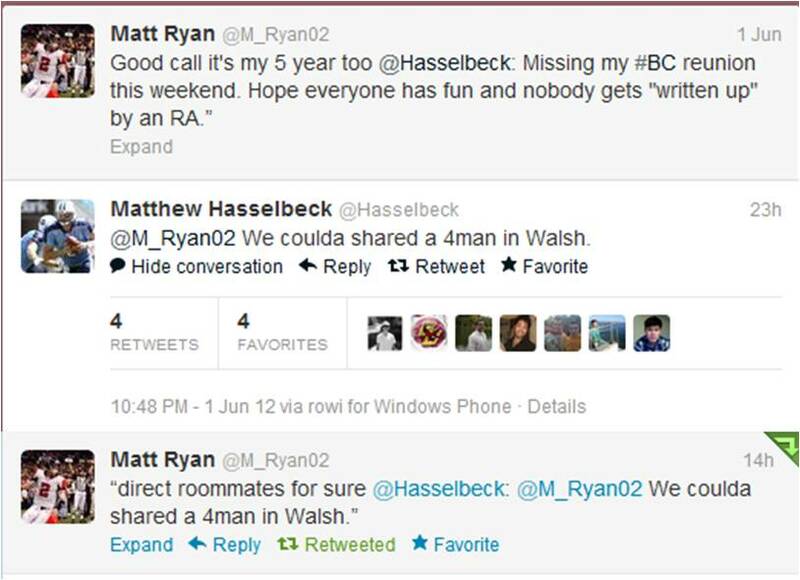 But what if...what if Hasselbeck and Ryan had competed for the BC job at the same time. Who would have prevailed in this hypothetical QB controversy? Both could take big hits. Both proved they could adapt to new offenses. Both had the leadership intangibles. It would be a tough choice. Hasselbeck was more mobile. As a college player, Ryan had the better arm and proved to be great under pressure. I think if it came down to it, I would have to go with Matty Ice. BC target and Xaverian standout Maurice Hurst Jr. verbally committed to Michigan Saturday. He's just the latest "would've, should've, could've" recruit to slip through BC's fingers. As I've said many times, I don't care about recruiting rankings. I do care about BC's ability to close on recruits who we want. Defensive Line is a position of need and a position where we have groomed guys for the next level. Hurst even favored BC at the start of the process. Yet he'll be playing elsewhere. Congratulations to the Women's Sailing team. They won another National Championship. This is now the school's sixth National Championship. Quite an accomplishment. Perhaps we should change to school motto to "Ever to Ex-sail"! Earlier this week, Eagle Action Publisher Mike Rutstein announced that Gene Defilippo cancelled their scheduled interview after deeming the questions too backward-looking about the football program. In the spirit of good blogging, I decided these questions needed to be made public!!! So I flew up to Boston, broke into the Athletic Department, logged on to Gene's computer and copied the questions. **** What follows are the hard hitting and clearly offensive questions. It is no wonder Gene wanted nothing to do with the interview. We are all clearly better for his PR skills. When you said Spaz was the best coach in 15 years, you were talking dog years, right? Who did you have in the “upperclassman Spaz is most likely to kick off the team unnecessarily” pool? Spaz went through two offensive coordinators last season. Do you think he can burn through three this year? Does Spaz’s contract pay him a bonus for unused timeouts? What gave you more personal pleasure in the last year: winning the National Championship in Hockey or blocking UConn from the ACC? When will Men’s Lacrosse be a varsity sport again? *** I totally made this up. ****I made up this part too.